Carols, lights, mummers, candles and a lamp post! 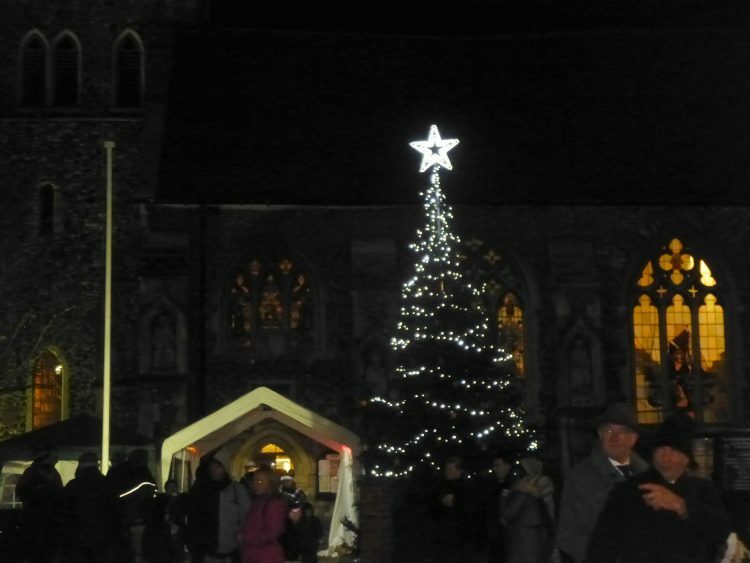 Last night Graham and I went over to Maldon to sing carols with All Saint’s choir for Maldon’s Vintage Fair. We didn’t really know what to expect. The road was closed off at the roundabout, so we couldn’t go up Market Hill like we usually do. It was a job to find somewhere to park. There seemed to be crowds of people walking around. Usually Thursday nights in Maldon are very quiet. Something was obviously going on. As soon as we had walked up to the High Street we saw why. The whole street was full of stalls selling all kinds of Christmas stuff and all sorts of food, a stage with live music, a roundabout, pop up cafes, beer tents from both Maldon’s micro-breweries – and it was all heaving with people. We managed to squeeze our way into the church – also heaving, with stalls in every little space. The choir did about half an hour of ‘request’ carol singing. 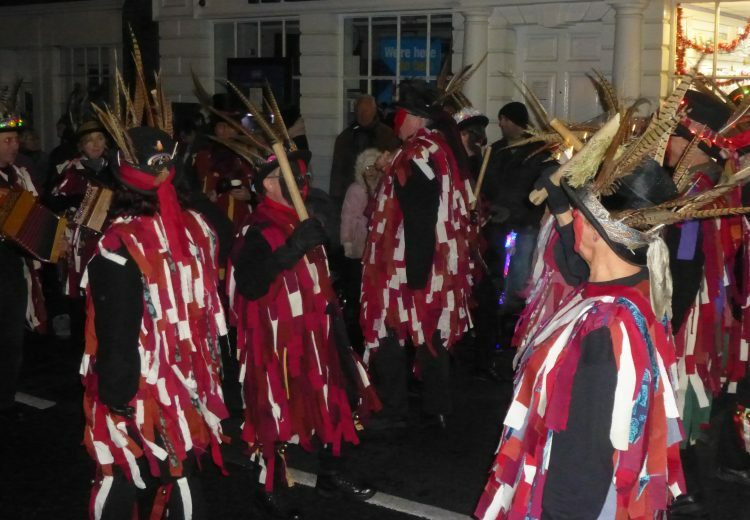 Then outside again, where a troupe of mummers was dancing in the middle of the street. 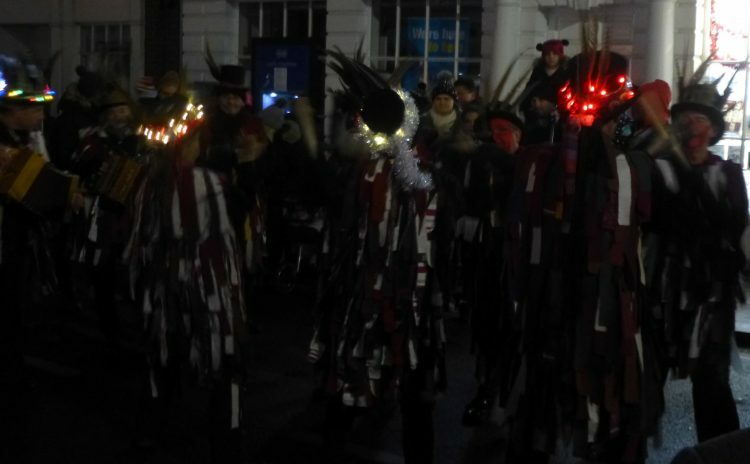 The photo below is not such a good one, but it does show the charming detail that they had Christmas lights round their hats! 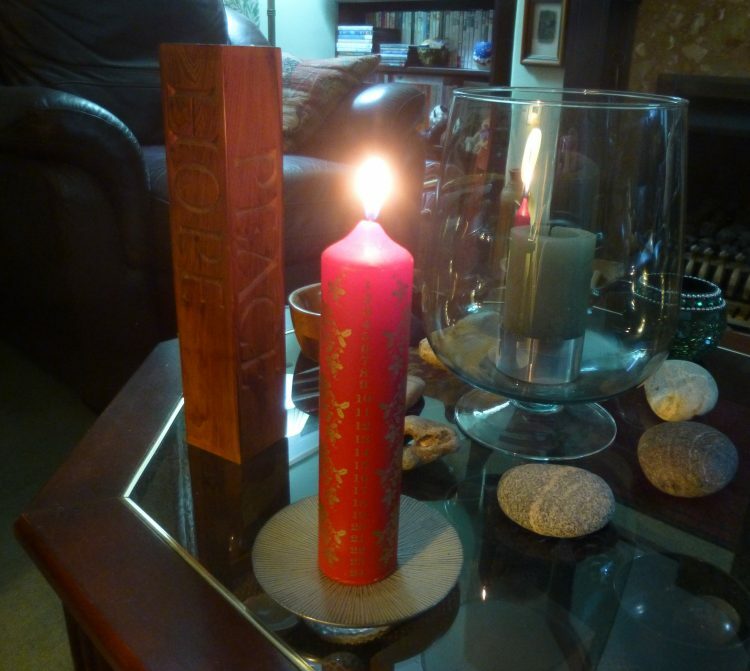 All the shops seemed to be open, and Graham bought me a red Advent candle . . . So with one thing and another I’m feeling really Christmassy now! Quick reminder: St Leonard’s Christmas Bazaar tomorrow, from 10.30 – 2.00. I went down to sort my stall out this afternoon. 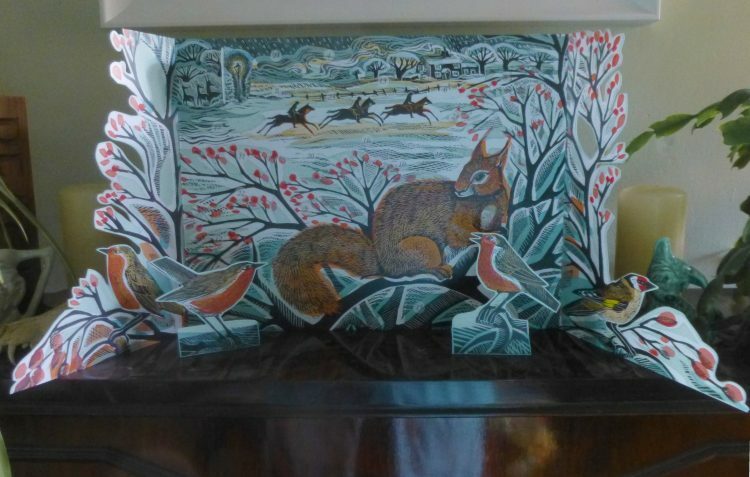 Another chance to buy my Christmas cards, 2018 Calendars, Essex Wood books and cards, and mugs. There are lots of stalls with all the traditional things and lunches and other refreshments available – do pop in if you’re in the area, St Leonard’s church hall CO3 4BL.